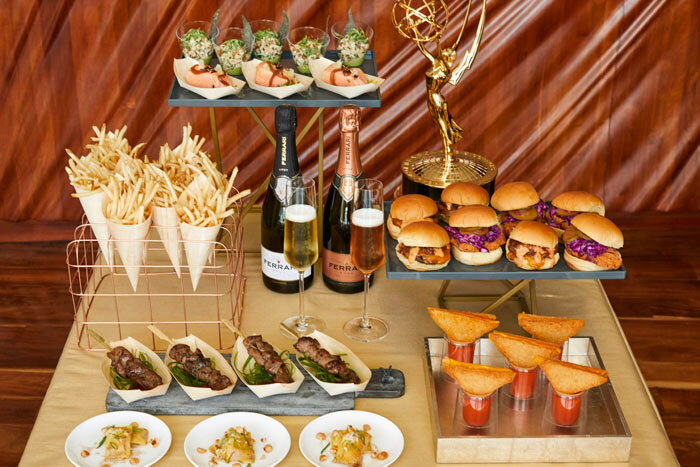 To celebrate the 70th Anniversary of the Emmy® Awards, the Television Academy is rewriting the script for its exclusive Emmy after-party celebrations: The Governors Ball will feature a star-studded reception-style after-party event at the rooftop L.A. Live Event Deck. Earlier this week the press got an advance preview of the events' decor, menus, and inspiration for the 2018 event, and it was all fantastic! 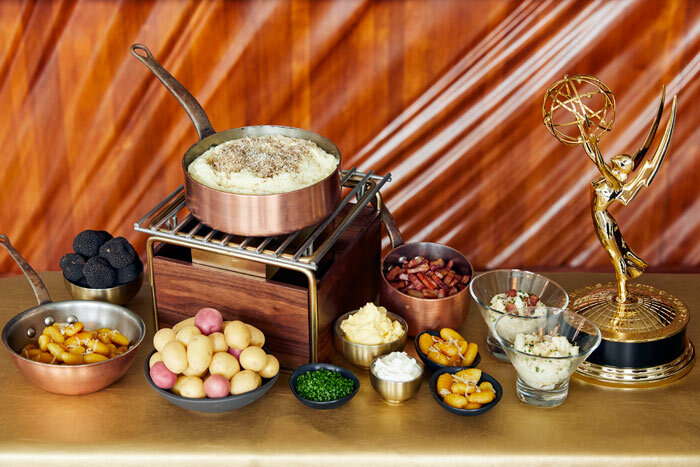 “This year’s menu brings a new level of culinary creativity to the Governors Ball, and alongside the Television Academy, we’re beyond thrilled to share each individually unique dish with our guests,” says Splichal. 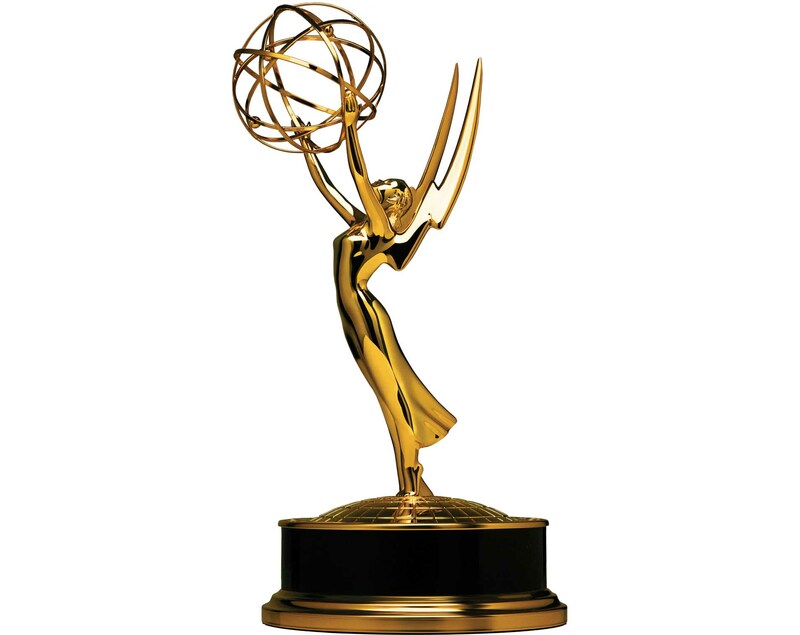 “We’ve incorporated more variety than ever before, with healthy, plant-based options, as well as renditions on Patina classics.” Please see Patina recipe below to make at home and enjoy during the Emmy Awards. The Patina Group Catering expects to serve 126,000 miniature plated dishes, plus 50,400 single-bite hors d'oeuvres. Chef Joachim Splichal and his team, who are catering the Governors Balls for the 23rd year, are planning their most extensive menu yet, using 20 executive chefs and 250 chefs for each event. Inspired by Michelin-starred restaurant Patina and L.A. steakhouse Nick & Stef’s, the menu will feature small-plate reinterpretations of classic dishes, such as Patina mashed potato, brown butter gnocchi and summer truffles with bacon, crème fraiche, chives and Maldon sea salt; hand-carved flat iron steak with red wine Bordelaise; and cave-aged mini gruyère popovers. Also on the menu will be an assortment of vegetarian and vegan offerings sourced from local farms. L.A. Kitchen will again be assisting with food preparation. 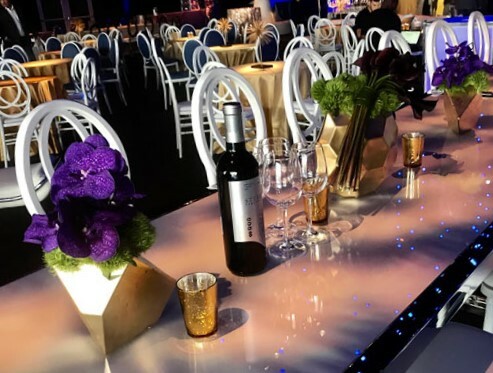 Furniture, table linens, florals, and other decor in shades of blue, gold, white and silver metallics will grace the venue. More than 450 assorted table linens will be required for each of the three nights, and will include in excess of 4,500 yards of fabric. 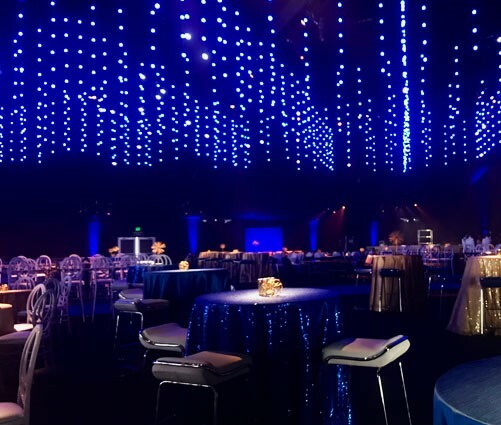 L.A. Premier will provide florals, ShowPro will handle audiovisual production, Bright Event Rentals will provide rentals, and Resource One will handle textile design. Great to hear one of my favorite chefs has been elevated to Executive Chef at The Outpost at the Goodland in Goleta, and even better to go spend an evening tasting some of the delicious new plates he is putting out for patrons. I've had the pleasure of having him pepare plates for me that were outstanding in the past, and was very happy to go back to see him working in his new role with the hip 50s themed hotel. They say that all good things are worth waiting for, and in the case of Outpost’s search for a new executive chef, good things were already there. 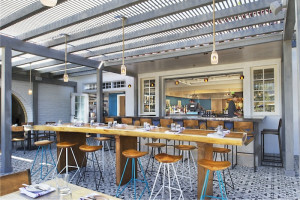 Outpost at the Goodland appointed its former executive sous chef, Damien Giliberti, as Executive Chef of the bustling Goleta restaurant gem. Giliberti brings his passion for community and love for California cuisine to the hip and laid-back eatery. 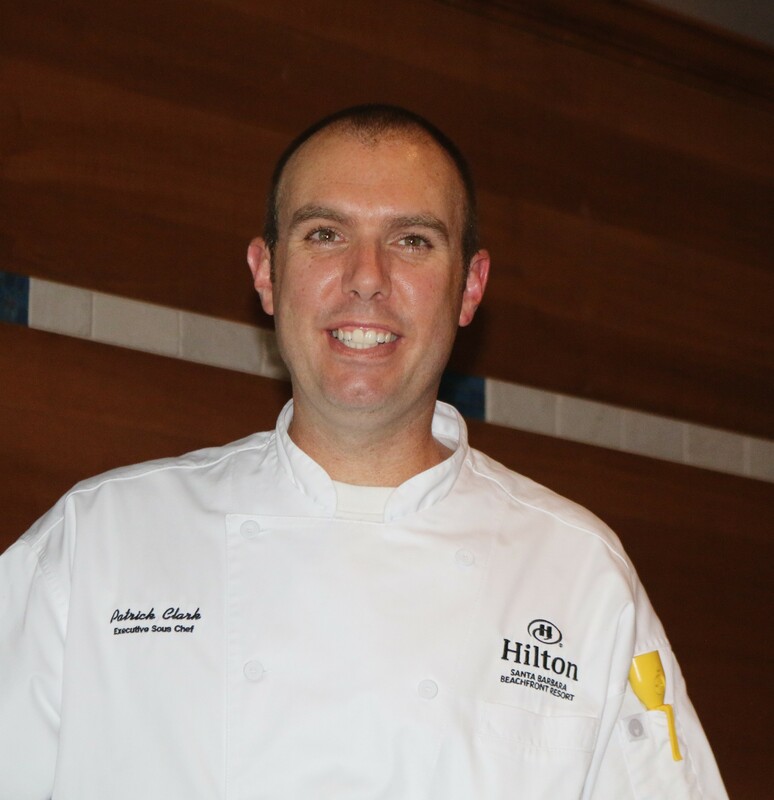 Phillip Arellanes was appointed as the new Sous Chef to work with Chef Gilberti. A native of Northern New Jersey, Giliberti draws inspiration from his Italian-American upbringing, where his family owned and lived next to their pizzeria. 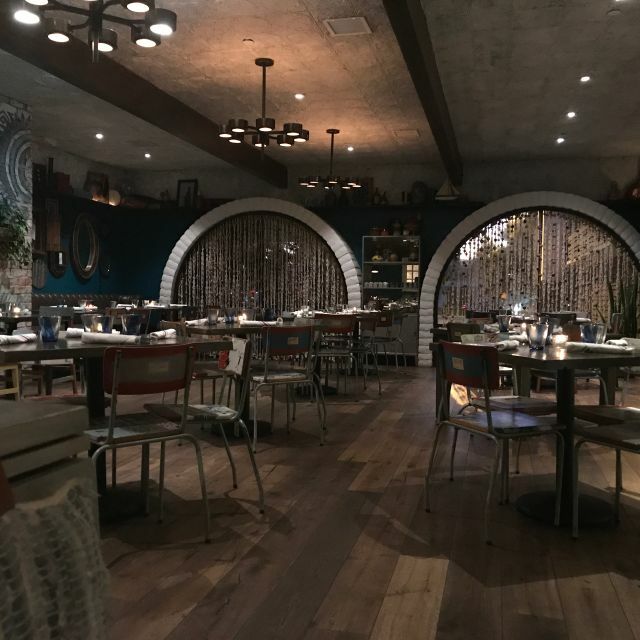 A graduate of Johnson and Wales University in Miami, Giliberti held stints working in kitchens from North Carolina to Miami, before heading West and taking a post at Finch & Fork for 4 years, then Outpost for the past 2 years. 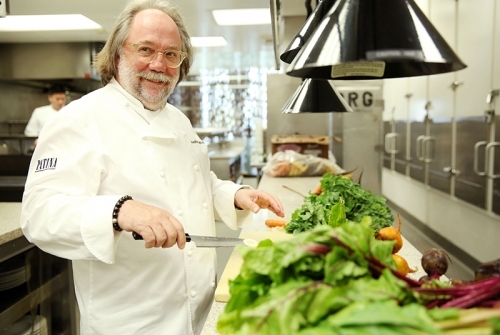 His experience shaped his culinary background, where he honed his craft in cooking contemporary and rustic American cuisine with touches of Latin and Asian influences. Now helming Outpost’s kitchen, Giliberti will continue to create simple, yet flavorful dishes that speak to California’s seasons. 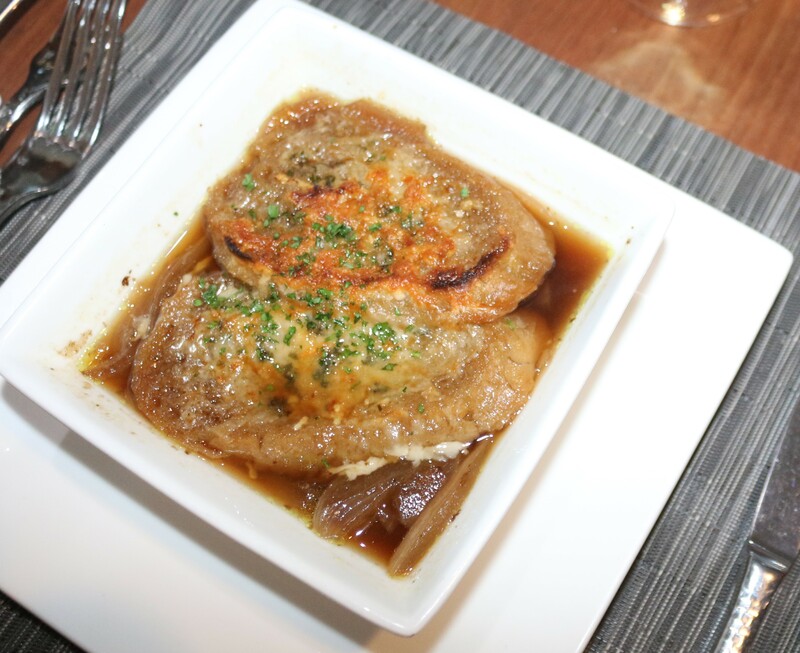 Chef Giliberti’s debut menu as Executive Chef feature some past favoites and some bright, flavorful new dishes that speak to the season. 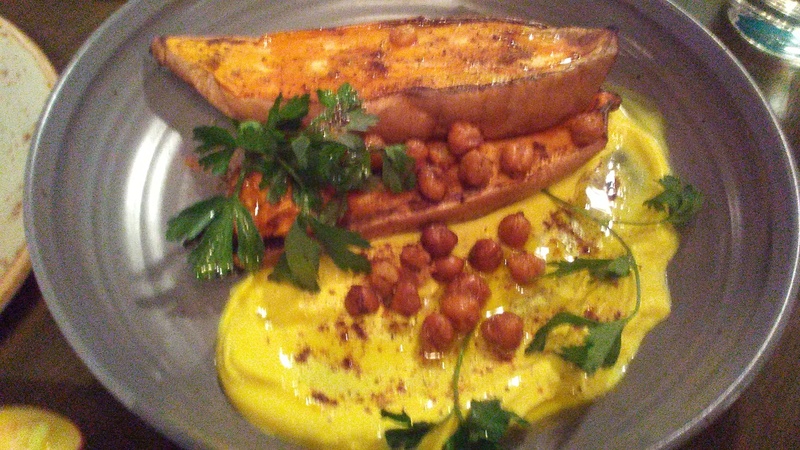 Try his Caramelized Sweet Potato to start with a turmeric yogurt, crispy chickpeas, and garam masala, which is truely delicious. 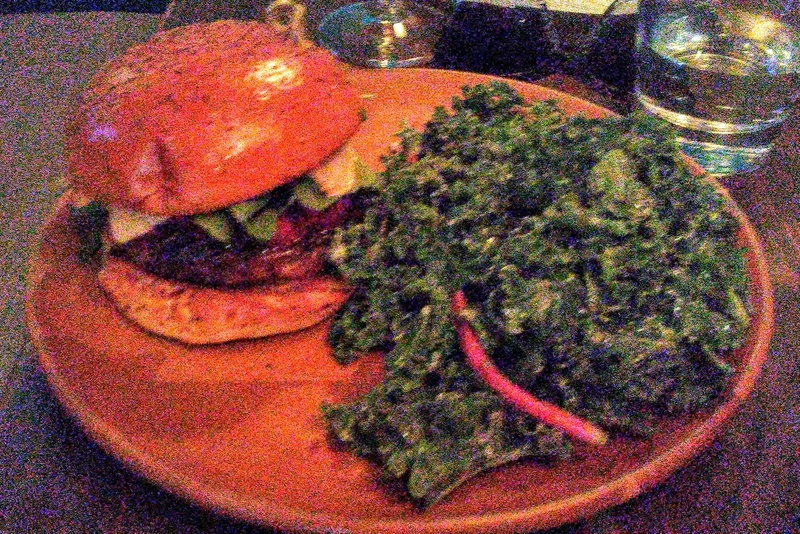 His Tuna Crudo with yuzu dressing, diced fuji apples, avocado puree, radish and chili oil is very refreshing on the palate, while his Lamb Burger with date chutney, harissa yogurt, pickled red onion, and watercress is a delicious flavor bomb. 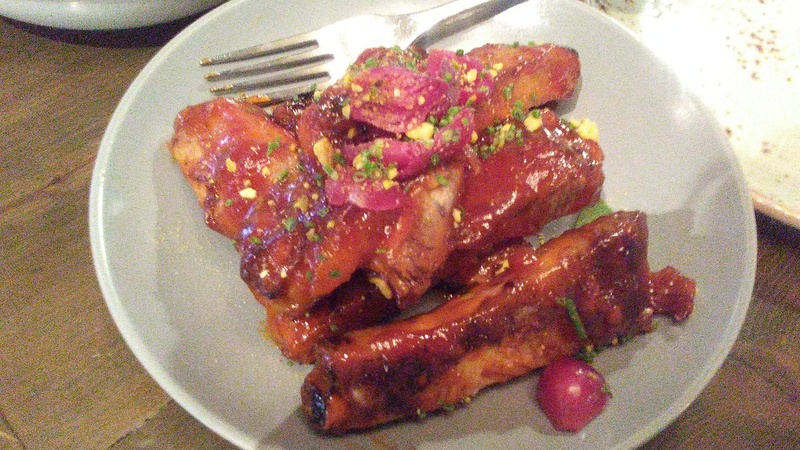 You’ll also find dishes like Pork Ribs with honey citrus bbq sauce, pastachios, and pickled pearl onions simply divine and perfectly cooked. Fish lovers will be delightfully surpised by Salmon with romanesco puree, roasted heirloom carrots, sautéed sugar snaps peas and chipotle hollandaise sauce. Wine pairing is easy at Outpost. They have a wonderful wine list filled with fine local wines, some national favorites, and a few european sips that are lovely. They also carry two pricy but wonderful Roblar wines by the bottle; Triomphe & Grassetto that are a solid choice. What is it they say "Drink the good stuff - life is short"! My favorite at Outpost is Halter Ranch Cabernet Sauvignon 2015, a Paso Robles wine that pairs very well with steak, ribs and pork chops, and appeals to my personal taste. Outpost has a team of talented people who whip up some fantastic cocktails for the unique liquor lovers in the house. Going into fall there will be some thoughtful new cocktails coming over the bar, and one that reminds me of the beloved Manhattan, a favorite of my parents, is a cocktail creatd by mixologist Jordan Davenport named Strawberry Fields Forever, containing strawberry infused Highwest Rye, Poppy Liquer and Sweet Vermouth; simply served over ice in a short glass with a slice of lemon. It's delicious! The casual bar offers local brews on tap, a bevy of bottled beers, and canned beers from the US, Mexico, and Belguim. Let's not forget the sinful desserts at Outpost. The three I tried all had their own unique twist, and were so delicious I'm sure I overate, but what's a poor dessert loving lady to do. I recommend surrendering to the fabulous sweets offered for a true sinful fete accompli to a delightful dinner in the dining room or on the outdoor patio. 6. Whisk until fully incorporated, then add the boiled udon into the pan and stir. 7. Bring the heat back to high, stir for 30 seconds and taste the sauce. 8. Add the chili flakes and season with more salt if wanted. 9. 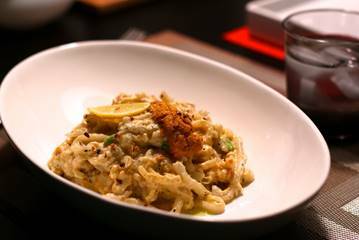 Plate the pasta, give it a few fresh cracks of black pepper and a small of red chili flakes. 10. Lastly garnish with a piece of fresh raw uni, a slice of lemon and serve! In a pot over medium-high heat, heat olive oil and saute onions until dark frown; about 20 minutes. Deglaze with sherry then add remaining ingredients and simmer for 10 minutes or until onions are soft. Place in heat resistant bowl then top with crostini and a good helping of cheese. Place under broiler until cheese is golden brown.